Those who support the idea that ecology and architecture are unable to coexist may need to reconsider it. Due to a period of multiple e-crisis (energetic, economic and environmental), the proverb which says that “necessity is the mother of invention” is at the top-of-the-list for anyone to move on. The art of creating a house preserving and taking as much care as possible of the environment is now possible and even becoming a priority to more and more people. Eco houses are becomming more and more popular, also in Mallorca. Therefore, both architecture and ecology are frequently interwoven, letting the first reinvent, reconsider and re-create the concept of building. In this sense, Mallorca has adapted to the current times. 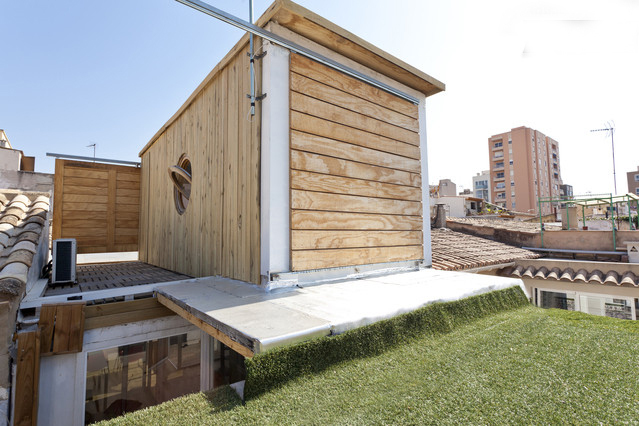 Started in North-America and quickly extended to northern and central Europe, the trend of recycling shipping containers, shaping and transforming them into perfectly inhabitable spaces with all sorts of facilities has arrived right in the heart of Palma. The Fly House B&B, available for rent via Airbnb, was designed by its owners, Balbina and Miquel Àngel, an enterprising couple, passionate about the arts in general, who also run the interior design studio Espai Fly. 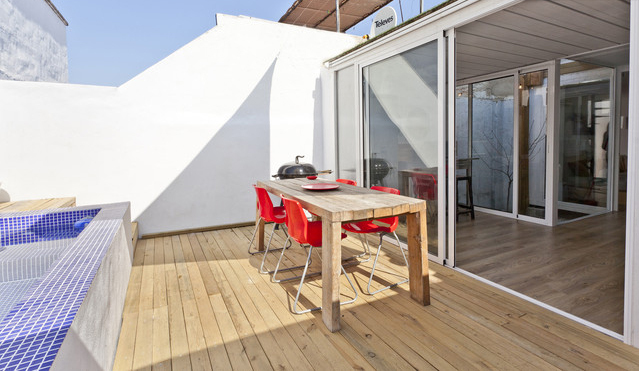 Fly house consists of a two-storey house made out of three 20ft shipping containers perfectly conditioned and insulated against changes in temperature from season to season, as steel is a conductor of heat and cold. The ground floor has a living room, a bathroom and a kitchen with access to the icing on the cake: the back yard which holds a lovely dining area and a swimming pool. A spiral staircase leads up to a more private space: the bedroom. The whole building is an homogeneous project of friendly-environmental design. Apart from giving a second chance to unused shipping containers, it also has wood slats on the upper bedroom unit to provide a rain screen and shade to help reduce heat gain; rainwater is collected from the roof, and rooftop solar panels heat domestic hot water. This way, energy-efficient appliances and lighting reduce electricity use. Everything is complemented and decorated with the most trendy taste for wooden flooring and furniture. What it is incredible is that the entire project was completed in just six weeks, which provided considerable savings in time, money, energy and dust. Filed under Modular Villas, Townhouse, Unique Homes. Tagged living in Palma, palma de majorca, swimming pool.